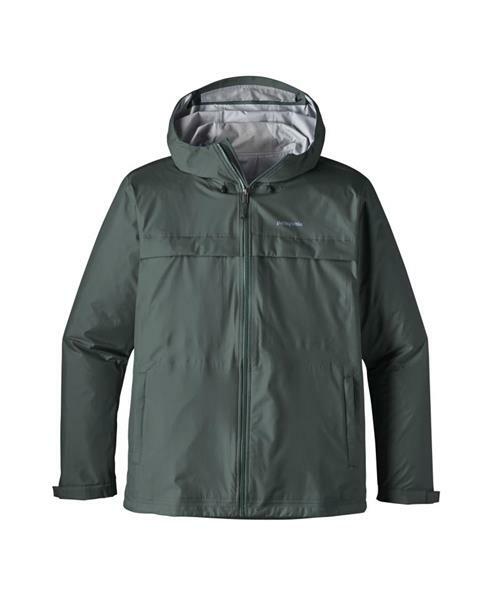 This is Patagonia's tribute to you, the Northwest bike commuter whose sense of optimism never falters ever after 18 straight days of showers and clouds. Lightweight and packable, the Idler Jacket blocks the wind and rain of stormy weather, breathes when you’re working up a steam and stuffs into its own pocket for packing into your luggage or courier bag. It has a 3-layer waterproof/breathable H2No® Performance Standard 100% recycled nylon shell with a DWR (durable water repellent) finish to stop moisture and increase durability. A circular knit backer lines the interior of the Idler, whisking away moisture and providing a smooth glide when layered over insulation. A polyurethane-coated center-front zipper and a 2-way-adjustable, helmet-compatible hood (with a built-in visor) provide maximum weather protection and exceptional coverage and visibility. Other features include reflective detailing on the zipper garage and back yoke, cuffs that adjust with double snaps, two chest pockets, and two side-entry handwarmer pockets lined with fleece for comfort; the right handwarmer pocket converts to a stuff sack. Hip length.